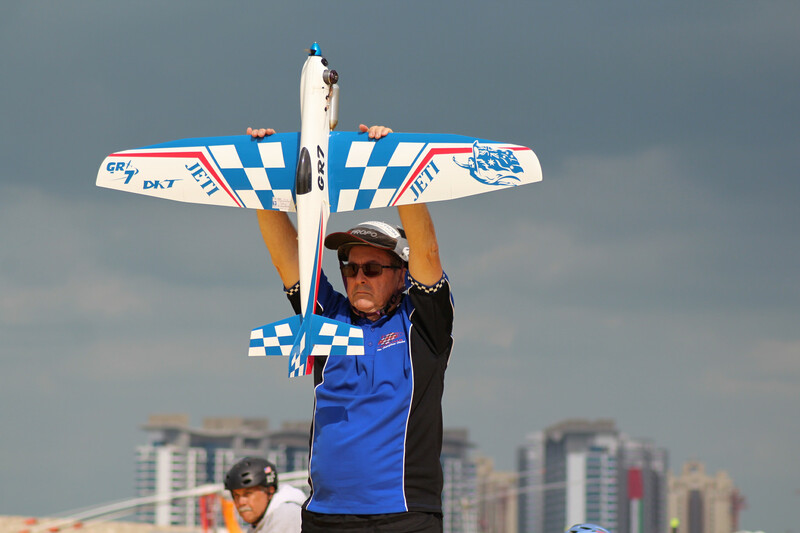 "This is the peak," declared Bruce de Chastel as he fought back tears after clinching the FAI World Air Games title in the Aeromodelling F3T, or Semi Scale Pylon Racing, final. "I didn't even dare to dream about this. It's too much." De Chastel, partnered by his wife Linda, who helped at take off and called out turn times through the race, said he was surprised to have made the final. He had planned to fly a steady race hoping for third place. But early in the 10-lap race, a mid-air collision between Italian Paolo Mucedola and the USA's Jim Allen sent the Italian's plane crashing out of the competition. The American then planed out of the race, having secured bronze and leaving de Chastel and German Mario Müller scrapping for gold. Despite his faster speed, Müller's plane clipped a pylon, forcing him to do an extra lap, and de Chastel, whose carbon fibre GR7 plane flies at 315km/hour, was able to fend off the attempt to lap him and hold on to the lead. All the finalists had come through 10 heats and two semi finals. De Chastel nursed his winning engine, saying it had ripened like a fruit during the competition. Celebrating with a loop-the-loop in the air and a big kiss with his wife Linda on the ground, de Chastel said that becoming world champion was the crowning glory of his 40-year aeromodelling career. Check the Live Scoring on the World Air Games Dubai website for full results.